This CD contains virtually every piece that Schubert wrote for solo piano. 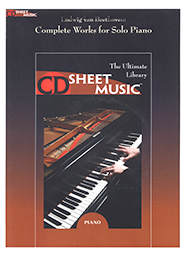 Included are all Sonatas, Impromptu, Moments Musical, plus all the Dances and music for piano 4-hands - over 1200 pages of sheet music. Franz Schubert was born in Vienna, Austria, in 1797 and died in Vienna, Austria, in 1828.